MSOE staff member Jordan Weston shows the finished rapid-prototyped piece constructed of sintered nylon. The face vessels made by African-Americans 150 years ago in Edgefield, South Carolina, might have been small, but they told big stories — stories of cultural movement, human survival, spiritualism and technological prowess, according to Jon Prown, director for the Chipstone Foundation. 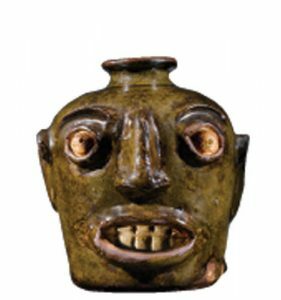 Under curator Claudia Mooney, Chipstone has created Face Jugs: Art and Ritual in 19th-Century South Carolina, an exhibition that opens at the Birmingham (Alabama) Museum of Art on January 13, 2013. The exhibit, which originated at the Milwaukee Art Museum and was also on display at the Columbia Museum of Art in South Carolina, has a modern story to tell as well — one that demonstrates the power of 3D technology to eliminate geographical barriers and preserve culture for future generations. The original 19th-century face jug from Edgefield, South Carolina. Courtesy of the Chipstone Foundation. 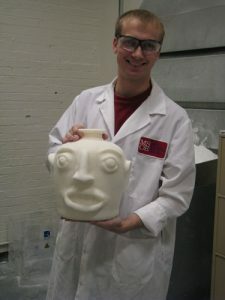 The modern face jug story was initiated by Brian Gillis, who under commission from the Chipstone Foundation conceived a contemporary artwork called Of Ghosts and Speculation. 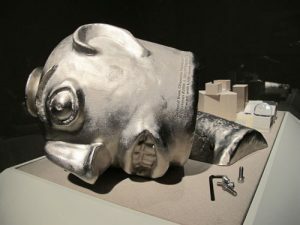 Gillis’ piece is a time capsule in the form of a metal-plated face jug outfitted with compartments containing archive materials documenting19th-century face jugs. The archives include a small book with a magnifying glass for reading, audio-visual materials on a hard drive and two thumb drives, and a piece of alkaline-glazed Edgefield clay. 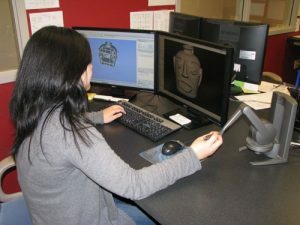 Making Gillis’ vision a reality was the Milwaukee School of Engineering’s (MSOE) Rapid Prototyping Center (RPC), which used Geomagic software to model the time capsule from 3D scan data of an actual 19th-century Edgefield face jug. Working from his home base in Oregon, Gillis laid out the details of the project for MSOE and supervised the ongoing work without ever meeting Vince Anewenter, RPC manager of operations, or anyone else doing the actual work. The entire project was coordinated by phone, emails, screenshots and pictures. 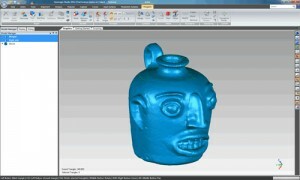 Vince Anewenter, RPC manager of operations for the Milwaukee School of Engineering (MSOE), uses a Creaform RevScan system to capture 3D shape data from the 19th-century face jug. The original face jug — about the size of a grapefruit — was delivered to MSOE by Chipstone, also located in Milwaukee. Normally, it would be covered in a powder to reduce the reflectivity of the ceramic finish, but that could not be done with a fragile, valuable piece. Anewenter covered the face jug with a fine black net containing target dots that the 3D scanner uses as reference points. 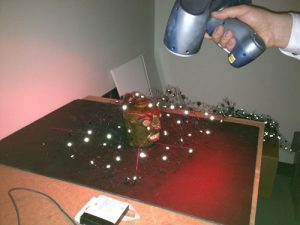 He used a Creaform RevScan hand-held scanner to capture the 3D shape data. Geomagic Studio processed all the 3D scan data, merging individual scans and intelligently filling in areas the scanner could not reach. Geomagic Studio software enabled Anewenter to fill in holes, patch together the different scan files and create watertight surfaces for the 3D model. Biomedical engineering student Nora Huang defines features using the Phantom haptic device with Geomagic Freeform software. For upsizing the scan model and creating the compartments and other features of the time capsule, MSOE turned to another Geomagic software product: Geomagic Freeform, a one-of-a-kind software that works with a touch device to enable fast 3D modeling of complex organic shapes. Biomedical engineering student Nora Huang used a Geomagic Sensable Phantom haptic device to add the sensation of touch to the 3D modeling work. The combination of the haptic device and Geomagic Freeform brings the flexibility of clay modeling into the digital world. Huang scaled the face jug to three times its original size, defined features, added the archival compartments, created a hinged door on the back of the jug and managed more than two dozen design iterations. 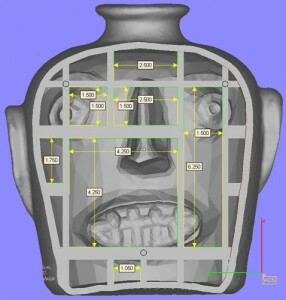 A drawing by artist Brian Gillis showing the original dimensions of compartments within the face jug time capsule. One of the major changes in the development process involved how the time capsule would be manufactured. The piece was originally designed to be cast in stainless steel, but the budget and schedule wouldn’t accommodate that. Anewenter proposed redesigning the model so a rapid prototype could be produced on a 3D Systems Sinterstation 2500+ selective laser sintering system, then nickel-plating it to add strength and durability to the final piece. The nickel-plating process brought still another geographical region into the project — Baltimore, Maryland, home of RepliForm. The company specializes in a metal-coating process that enables rapid-prototyped parts to be used in demanding environments. Like MSOE, RepliForm seems to revel in challenging projects with odd geometry, having created plating for everything from medical and automotive parts to jewelry for Stella McCartney. RepliForm used cyonoacrylate glue (super glue) to seal the nylon rapid-prototyped time capsule before the nickel-plating finish was applied. The plating procedure was then fairly straightforward, except for the deep, narrow compartments. The final display of Brian Gillis’ work, Of Ghosts and Speculation, at the Milwaukee Art Museum. Gillis’ finished time capsule not only spans centuries but looks to the future. It’s formed from work in Oregon, Wisconsin and Maryland. It is the product of the best technologies that bridge the virtual and real worlds. It’s both a time capsule and archive — built to last for ages. Judging from the results of his own project and the tools brought to bear by the likes of MSOE and RepliForm, that time could well be the very near future. Bob Cramblitt writes about 3D technologies that are radically changing the way we work and live. He can be reached at info@cramco.com. Originally posted at http://boingboing.net/2013/01/02/recreating-19th-century-face-j.html and reposted here with permission of the author. One Response to "Edgefield Pottery Face Jugs Being Recreated Using 3D Technology"